If you’re planning to see more of our spectacular country, be sure to check out some of the iconic Australia tourist attractions scattered throughout its states and territories. From remarkable geological formations through to cultural institutions, across the length and breadth of Australia you’ll find captivating, intriguing and awe-inspiring sights that simply shouldn’t be missed. With so many great places to explore, we’ve chosen ten of our favourites. How many have you visited? When most people think of Australia, and Sydney in particular, it’s likely that some of the first images that come to mind are the Sydney Opera House and the Sydney Harbour Bridge. Spectacular in design and true icons of the city’s landscape, both structures are well worth seeing during a visit to the harbour city. 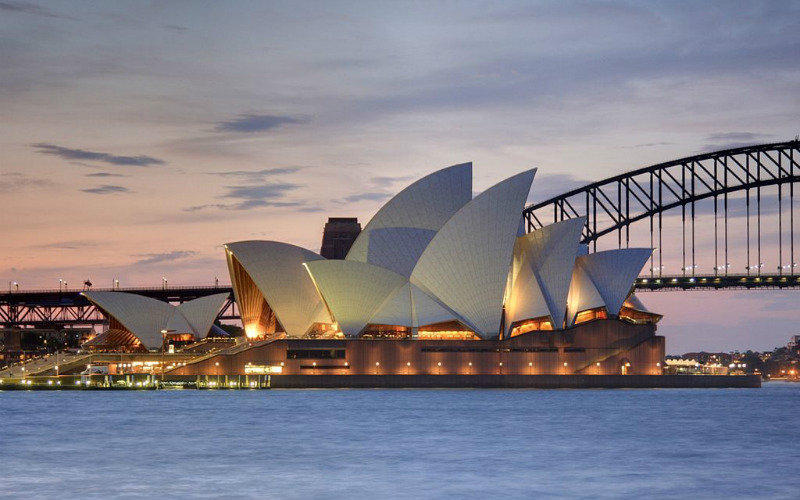 Behind the scenes tours of the Sydney Opera House allow you to get to know more about the history and workings of one of Australia’s best known buildings, while a Sydney Harbour Bridge climb is an unforgettable way to see the sights of Sydney and its surrounds. Sydney Opera House, New South Wales, Australia. Image Credit: Adam J. W. C. / CC by SA 2.5. Comprised of more than 3,000 different reef systems and hundreds of islands, the Great Barrier Reef is one of Australia’s most remarkable natural assets. 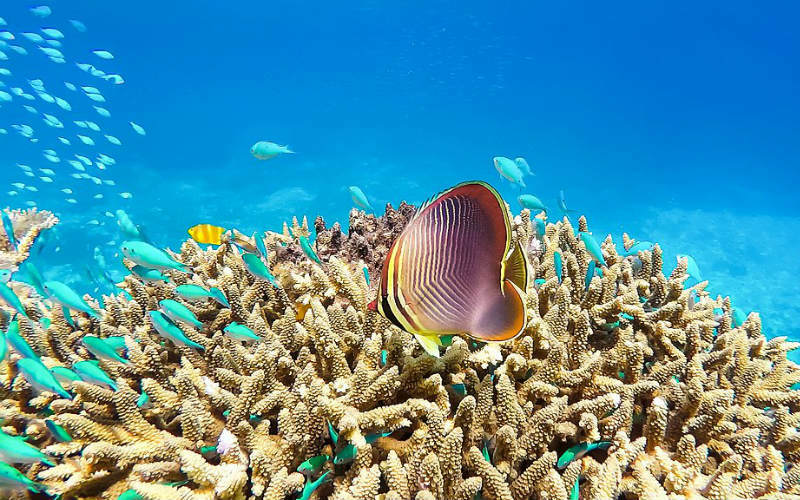 Located just off the coast of Queensland, the reef, which stretches from Bundaberg in the south through to Cape York in the north, is home to hundreds of different species of fish and an array of spectacularly coloured corals. Covering such a large area of the seabed, there are countless ways to discover this wonderful part of the country, from snorkelling and diving through to sailing, kayaking and unforgettable scenic flights. Great Barrier Reef, Queensland, Australia. Image Credit: Workfortravel / CC by SA 4.0. 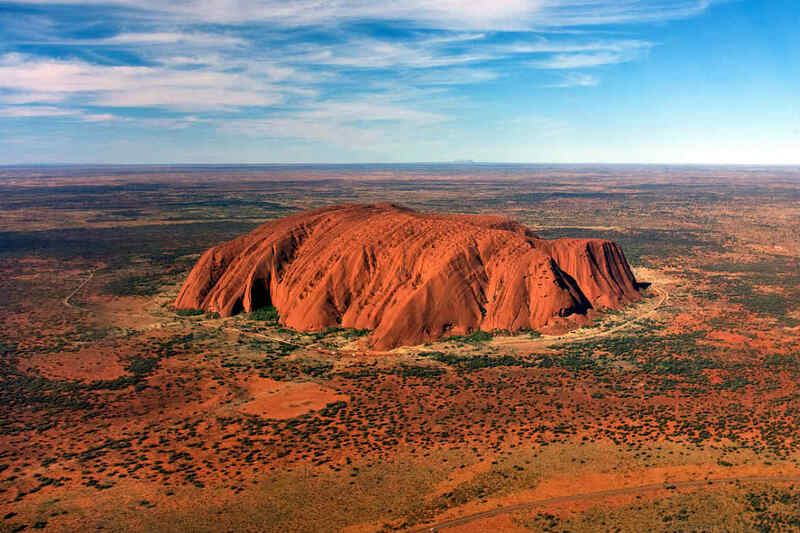 Thought to be around 600 million years old, Uluru is generally considered to be one of Australia’s most iconic sights. 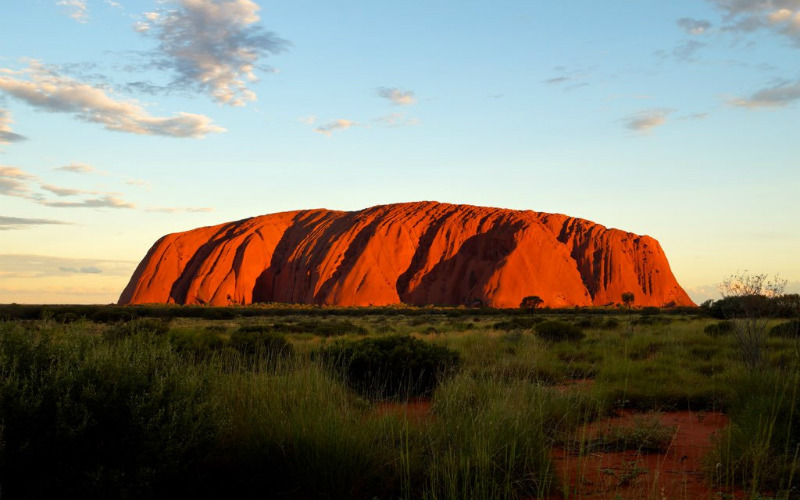 Standing at around 863 metres tall, the massive monolith emerges from the red soils of Uluru-Kata Tjuta National Park, making it a truly awe-inspiring sight to experience. Nothing short of remarkable in its scale, it comes as no surprise that the natural landmark holds incredible significance to the local Indigenous people. Spectacular at any time of day, Uluru is perhaps best viewed at sunrise or sunset when the rich earthy tones of its surface shift colour beneath the soft sunlight, and its grand figure is beautifully silhouetted. Uluru, Northern Territory, Australia. Image Credit: Romain Pontida / CC by SA 2.0. Another of Australia’s incredible geological formations, the Three Sisters have stood tall in the heart of New South Wales’ Blue Mountains National Park for more than 50 million years. Attracting visitors from across the globe, the weathered sandstone peaks have become a symbol of the area and one of its must-see attractions. 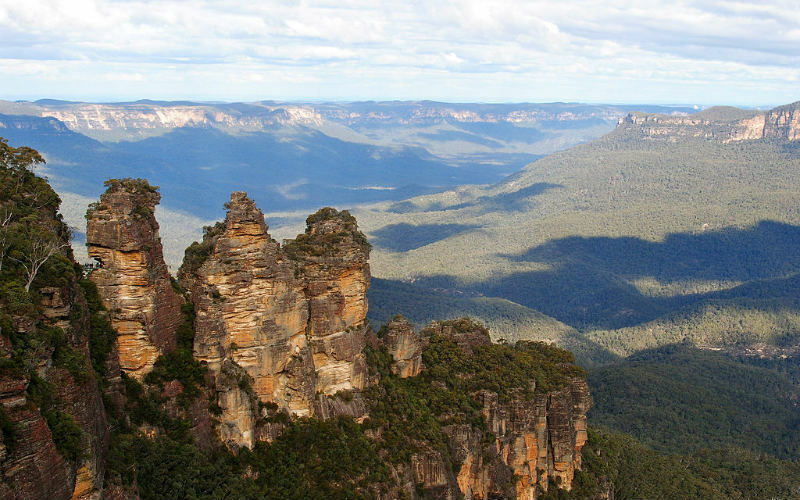 A trip to Echo Point lookout in Katoomba will offer you some of the best views of the Three Sisters, with the breathtaking Jamison Valley providing the perfect backdrop to one of the region’s most popular tourist spots. Offering such great views of Three Sisters and their surrounds, Echo Point is best visited early in the morning or late in the afternoon to avoid the crowds. Three Sisters, New South Wales, Australia. Image Credit: Sinead Friel / CC by 2.0. 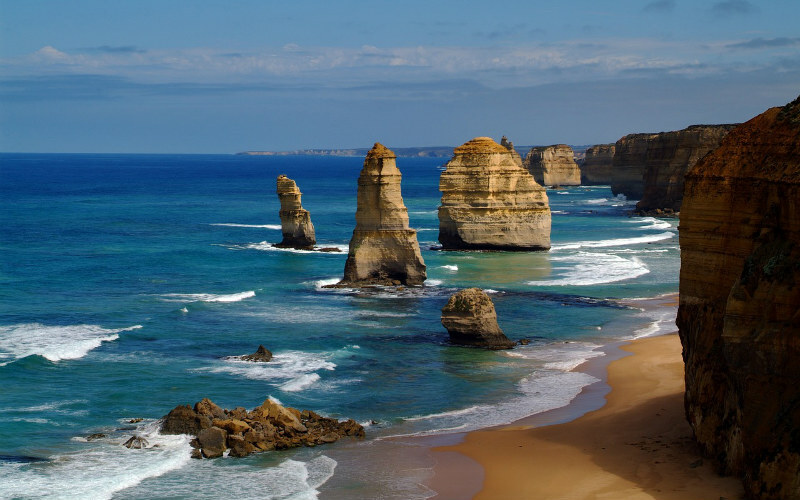 Located alongside the famed Great Ocean Road and around 275 km west of Melbourne, Victoria’s Twelve Apostles stand an impressive 45 metres above the waters of the Southern Ocean. Once connected to the mainland, the limestone pillars have been weathered and shaped by the wind and rain over time, resulting in their current height and form. Although there are only eight Apostles remaining after the collapse of one in 2005, this scenic landmark is still a very worthy addition to any travel itinerary, whether you’re planning to admire their fine forms from the nearby cliffs or the beaches below. One of Australia’s most famous coastal stretches, Bondi Beach has come to be a symbol of Sydney and the laidback Australian way of life. 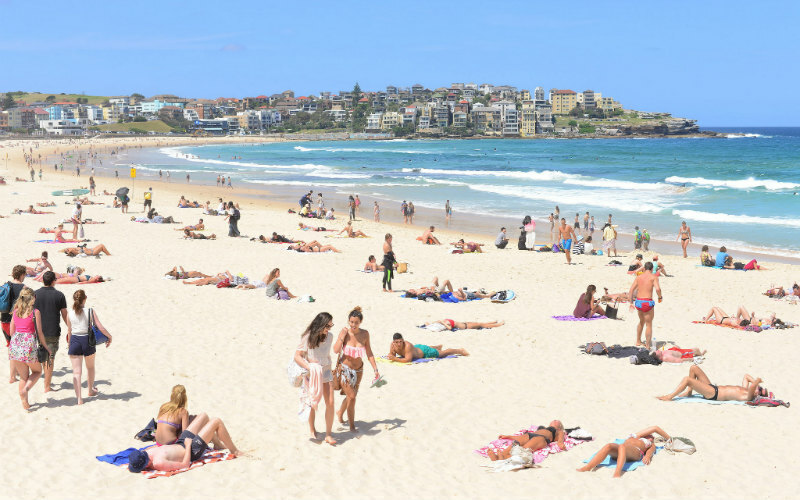 Located just a few kilometres from Sydney’s CBD, Bondi’s golden sands, decent surf and beautiful views attract tens of thousands of visitors every year, with everyone from backpackers through to international celebrities taking a dip at this world renowned waterside spot. Surrounded by cafes, close to wonderful coastal walks and hosting a variety of great events throughout the year, there’s always something to see, do or discover at the iconic Bondi Beach. Bondi Beach, New South Wales, Australia. Image Credit: Nicolas Lannuzel / CC by SA 2.0. Considered to be Tasmania’s most visited attraction, Salamanca Market has become one of Hobart’s unmissable experiences. Held each Saturday along historic Salamanca Place, from 8.30am to 3pm, the vibrant outdoor markets showcase the wares of more than 300 stallholders, with everything from hot food and fashion through to homewares and art on offer. Perfect for finding souvenirs, gifts and a few bits and pieces to spoil yourself, locals and tourists alike flock to this popular market each and every week. 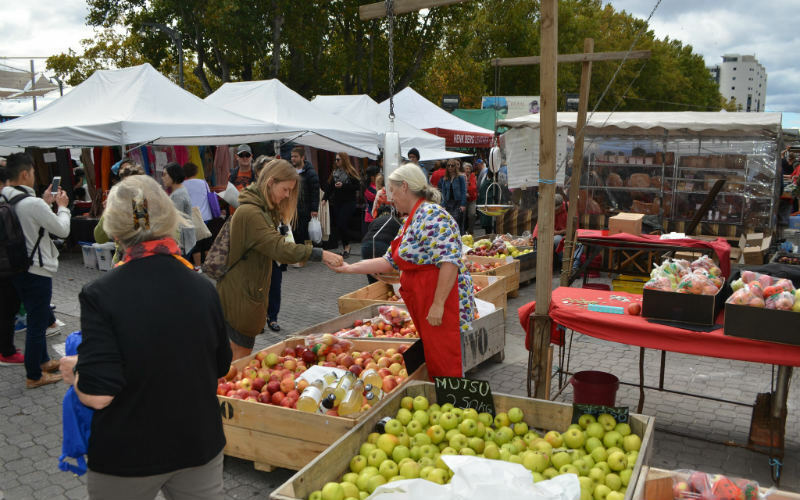 Grab a bite to eat, a cup of good coffee and spend a lazy Saturday wandering amongst the market’s fantastic stalls. Salamanca Market, Tasmania, Australia. Image Credit: eGuide Travel / CC by 2.0. 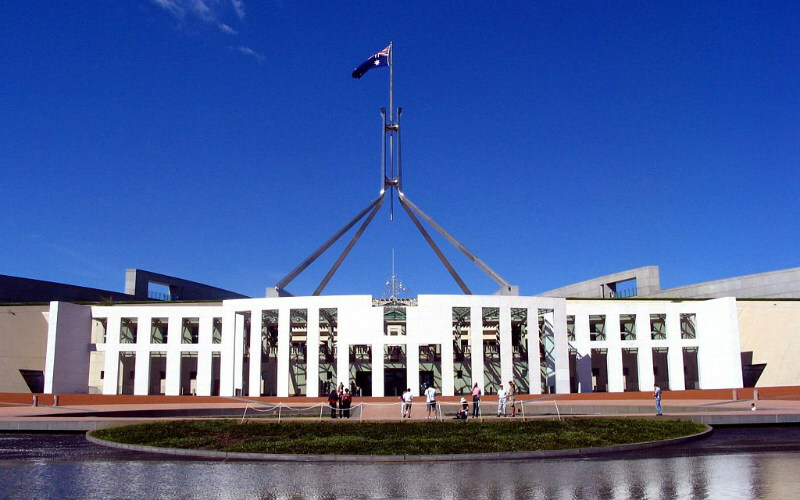 The home of Australian federal politics, Parliament House is one of the country’s most important buildings. Located in the heart of Canberra, Australia’s capital, the unique structure stands tall on Capital Hill, overlooking the surrounding city. Opened in 1988, it’s a great place to head to learn more about the Australian political system, with large portions of the grand building open for the public to explore. Time your visit right to take a seat in parliament’s public galleries and watch on as the country’s politicians discuss the latest legislation and are scrutinised by their counterparts during question time. Parliament House, Australian Capital Territory, Australia. Image Credit: Andrea Schaffer / CC by 2.0. A little slice of island paradise located just off the Western Australian coast, Rottnest Island has quickly become one of the state’s must-see destinations. 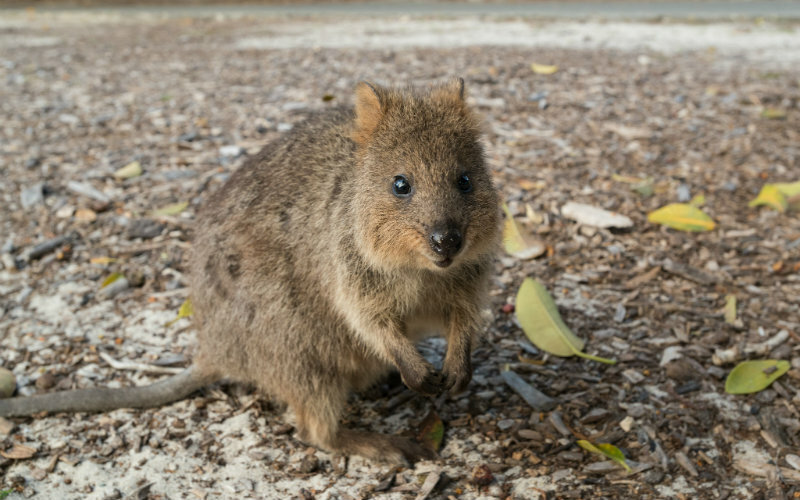 Perhaps best known as the home of one of the region’s cutest residents, the quokka, the island offers plenty of fantastic opportunities to disconnect from modern life and enjoy some time amongst nature. Bordered by beautiful beaches and colourful coral reefs, there are countless activities to enjoy during a visit to the island, from snorkelling and surfing through to guided walking tours, cycling and simply exploring on foot at your own pace. Most of the island’s biggest draw cards are found outside, so be sure to plan your visit to coincide with fair weather for the best experience. Quokka, Rottnest Island, Western Australia, Australia. Image Credit: ruerto42 / CC by SA 2.0. Worn and weathered by the elements over millions of years, Western Australia’s Wave Rock is an intriguing geological feature situated on the eastern edge of the state’s wheatbelt region. Standing at around 15 metres high and close to 110 metres in length, the granite formation, as its name suggests, looks remarkably like a breaking wave emerging from the dry earth below. Coloured with rich earthy tones, the spectacular formation appears to shift colour depending on the time of day, providing some fantastic photo opportunities for keen photographers. At over 330 kilometres from Perth, Wave Rock is not a short journey from the Western Australian capital, but is certainly well worth seeing in person. 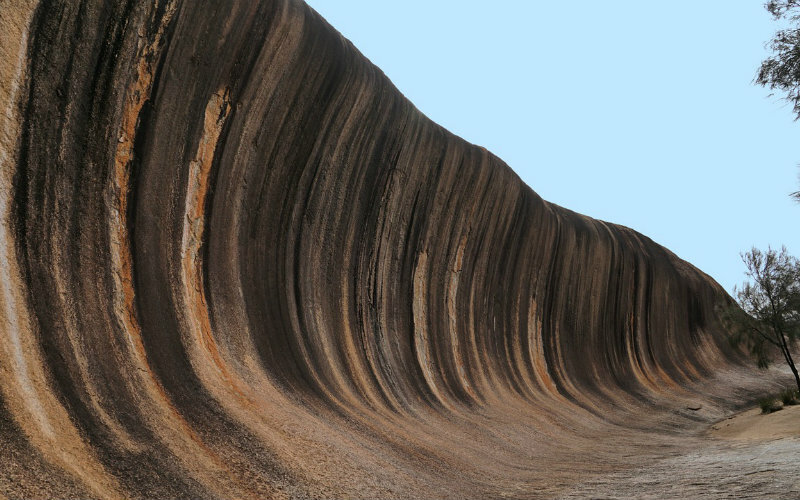 Wave Rock, Western Australia, Australia. Ready to see more of our wonderful country? Discover iconic Australian tourist attractions with cheap flights, hire cars and great hotels from Webjet! Feature Image Credit: Corey Leopold / CC by 2.0.